The city of Carrollton, Texas requires annual backflow testing of all backflow preventers, backflow devices and backflow valves, as part of the Carrollton Backflow Prevention Program as required by the state of Texas and federal law. This program is maintained in order to protects the water distribution system and to guarantee that potable water will be available to every citizen without worry of pollution or contamination. 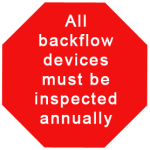 To find out more about the Carrollton backflow regulations go to http://cityofcarrollton.com/index.aspx?page=435. Backflow testers are required to apply for and be granted a backflow testing license from the city of Carrollton and that license must be maintained in kept current in order to do testing in the Carrollton city limits.